PDF reDirect is a freeware PDF creator which includes absolutely no limits and is not categorized as crippleware. Basic functions of the program include splitting and merging Adobe PDF files, encrypting PDF files, PDF file optimizations and it perfect for freeware enthusiasts in both a home and a small office setting. Adding passwords to PDF files is very simple and can be performed quickly on the right-hand side of the file explorer. 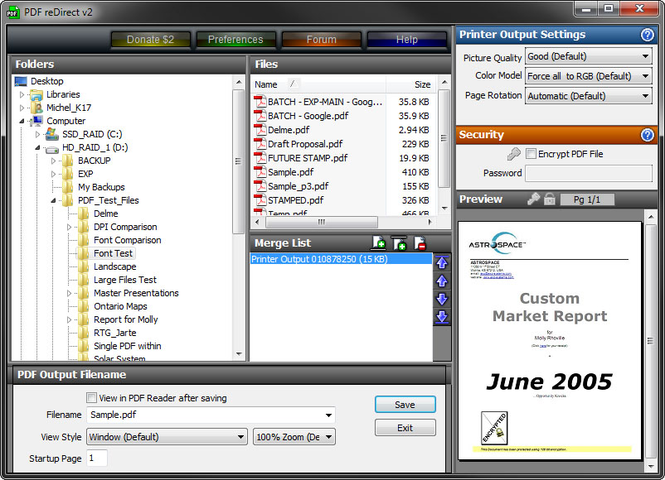 In terms of printing PDF files that you have created and/or opened with PDF reDirect, you can preselect the printing settings and color model along with page rotation. To merge PDF files, you can select a list of PDF files in the explorer list, choose which order the PDF files should be merged in and finally select the output file name in order to complete the operation..